Overview:Lijiang Baisha Village is one of the oldest towns in Lijiang City. The town is famous for profound Naxi ethnic culture and well-preserved ancient Mural Paintings. 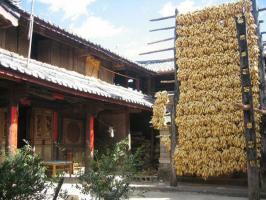 Lijiang Baisha Village is one of the oldest towns in Lijiang City. It got its name "Baisha" meaning "white sand" from the natural white sand on the ground. Baisha village is the oldest and earliest settlement of Naxi people, where the famed Baisha Mural Paintings were stored, preserved and displayed in some old houses.